I'm rubbish at coming up with titles. 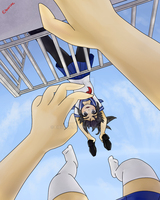 Anyway, this is that pic that Yanderedev posted on his blog way back when. While I personally haven't really had a chance to play any of the builds, I've heard that the stand model is in the game? Pretty neat seeing something you designed in 3d form. i have been Watching too much jojo's bizarre adventure. This is actually really dope and I want to draw this, full design creds to you, but only with your permission. Your next line is, "Nothing will get between me and my Senpai!" TOYU! Ayano: Nothing will get between me and my Senpai. NANI?! DQN (DQN系, dokyun-kei) - Pretends to be anti-social or acts like a delinquent when in fact he or she is not or cannot become like either one. Tells made up stories about gang fights or crimes, or boasts and pretends to know about that subculture. "DQN" is slang for "antisocial person" or "annoying delinquent". Subcultural/Hipster (サブカル系, sabukaru-kei) - Often avoids everything mainstream and has a heavy preference to "things that few people like" and establishes themselves as being special. People of this type do not really love the subculture itself but rather strive to obtain the "cool" factor by not having the same interests as others. Evil Eye (邪気眼系, jakigan-kei) - Admires mystical powers and thinks that he or she has a hidden power within them as well. It is this trait that they create an alias specifically for said power. This is also known as the delusional type. The concept part was cut off before hitting this and I was like: STANDING IN THE EDGE!! Talk about being caught in a bad romance This is a gloriously beautiful concept! do you take commission ? im curious, what do you think this stands stats/abilities are?? ...Dunno. I think YandereDev wrote up its capabilities in a document somewhere. Maybe you could find it on the wiki? ah! okay, i think i found it!! thank you! YOU THOUGHT THAT YOU WERE GONNA BE SENPAI'S FIRST KISS???!!! YOU WERE WRONG!!! BECAUSE IT WAS MEE!!! DIO!!!! Cry: HA HA HA HA HA HA HA HA HA HA! -Multiple Uses: Bad Romance can hold up to 8 things at the same time with it's 8 arms, making it useful for Ayano when it comes to kill her opponents/victims brutally or deal with multiple ones at the same time. -Super Strength/Senses/Speed: Almost identical to either Jotaro's Star Platinum or even DIO's The World, among many other Stands, Bad Romance possesses phenomenal strength, senses, and faster-than-light speed that, while below the mentioned Stands, it can subdue or even kill multiple people at once if given chance. -(Optional?) Time Loop? : Apparently Bad Romance's most dangerous power is the ability to somehow loop time to at least a day like Killer Queen's Bites The Dust from Yoshikage Kira, with one week being the most far Ayano can go back to, allowing Ayano to undo any mistake she ever did, like being discovered for killing someone. But even so, she does have limitation in which she must wait at least a day to use this ability again and that she must willfully end the loop. Wow, how did you do this? With a lot more revisions and edits than I'd like to admit. Look like yandere Chan persona. Hey, aea. I must say, I really like your style, and I love the way you designed this. Are you still working as the designer for YanSim? Yes. I did an alt uniform design a few days ago. As of right now, all the rival characters have been designed, so i'm not doing quite as much. Presumably once the production ramps up in the future, i'll be doing more. Cool, I'm looking forward to seeing more of your work!